I have been on something of a pizza kick lately, and not those commercially prepared pies with flavorless cheese and mushy veggies. I can directly pin-point when this all started. 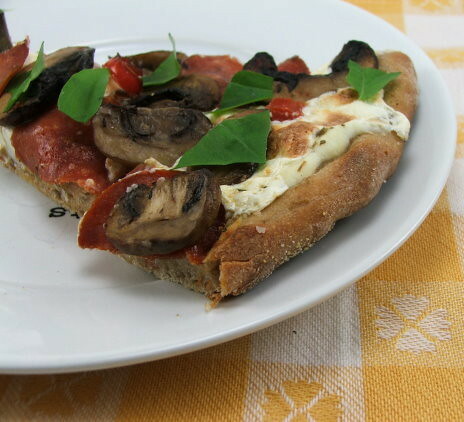 It began at the Mushroom Council lunch when Chef Kent Rathburn made us a grilled mushroom pizza. 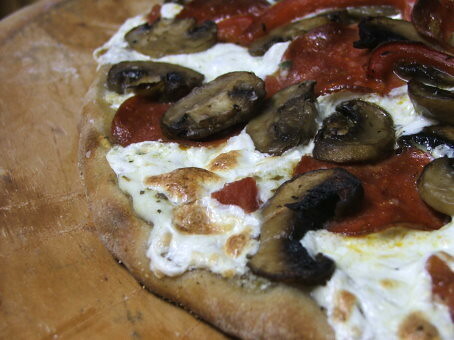 I knew in that moment that I would be making a pizza with grilled mushrooms. This is the result. 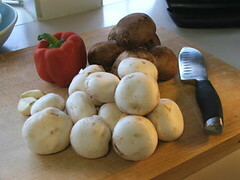 I used mushrooms that were available at the grocery store, portobello and white button, and added some red pepper for extra flavor. 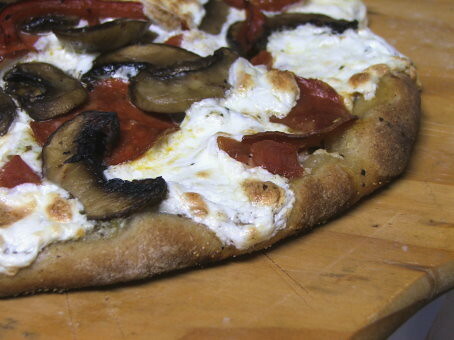 I will say this, grilling mushrooms is an easy way to add a soft smoky flavor and meaty texture to a pizza, and it may be the only way I do it from now on! I decided that instead of sauce I would just put diced tomato on my pizza, and along with some lovely fresh mozzarella cheese I would add some creamy ricotta. Of course, I added some pepperoni. It is my favorite topping. I’m not ashamed to admit it either. The crust is homemade, and I decided almost at the last minute to add about 1/4 cup of my sourdough starter to it. The starter added a nice tangy bite to the crust, which has a crisp exterior and a soft interior. If you do not have any starter do not fear. It is entirely optional, and the crust is still beautiful with out it. 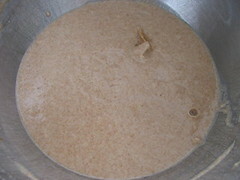 Prepare a sponge by combining the water, yeast, starter, sugar, honey, and what flour in a bowl. Stir to combine and allow to sit covered, at room temperature, for ten minutes. The sponge may not be terribly foamy or bubbly. To the sponge add the remaining ingredients and mix with the dough hook on low speed for 3 minutes. Adjust the hydration as needed (the dough should be tacky but not cling too much to your fingers). Increase the speed to medium and mix for 8 minutes. 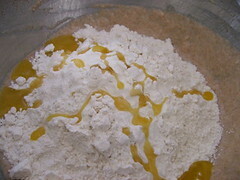 Remove the dough from the bowl and form it into a ball on a lightly floured surface. 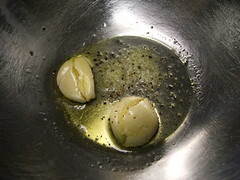 Transfer to a bowl coated with olive oil, turn once to coat, and proof for two hours, covered, at room temperature. 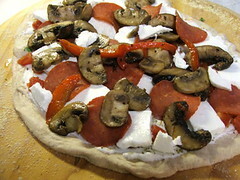 After the initial proof, degas the dough and store, covered well, in the refrigerator for 24 hours, or up to three days. 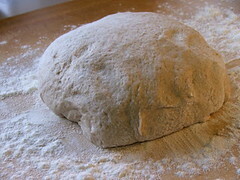 Pull the dough an hour before you are ready to bake it. While the dough warms up prepare your toppings and heat your oven to 500F with a pizza stone on the bottom rack, if you have one. With the flat of a knife crush two large garlic cloves. Mix them with the olive oil, salt, and pepper. 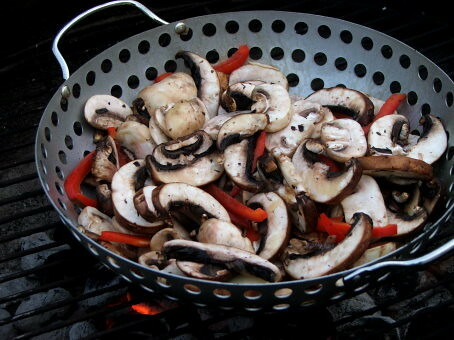 Add the sliced mushrooms and bell pepper strips and allow sit five minutes. 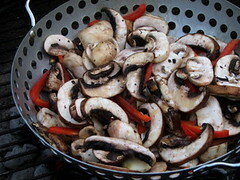 Transfer to a perforated grill pan and cook, over a very hot grill, until they begin to soften, about five to ten minutes. Transfer to a bowl to cool slightly. 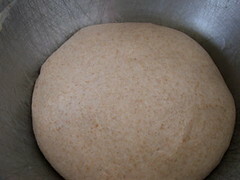 Divide the dough into two large or four small balls and, using your hands, stretch it into a thin circle. 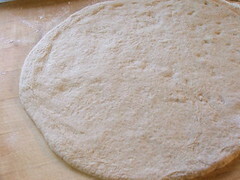 Transfer the dough to a pizza peel that has been dusted generously with corn meal. 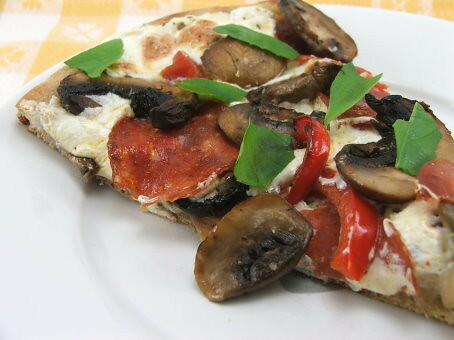 Top the pizza with a thin layer of ricotta, diced tomatoes, oregano, mozzarella, pepperoni, and the grilled mushrooms and peppers. 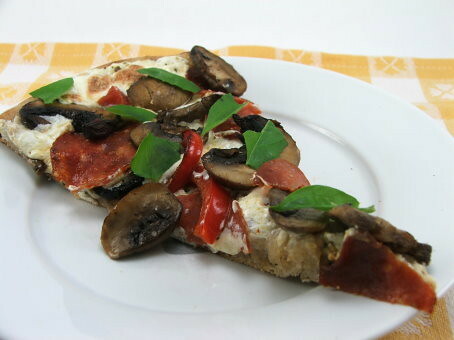 Cook the pizza for 10 to 15 minutes, or until the crust is crisp and brown and the cheese has melted and begun to brown as well. 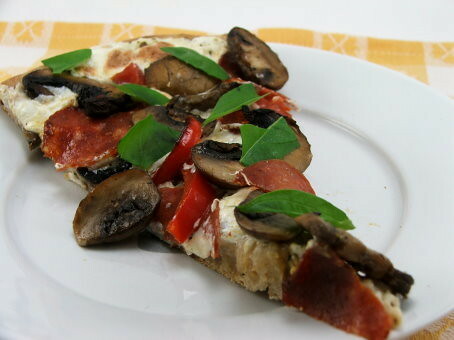 Allow the pizza to rest for five minutes before slicing. Top with torn fresh basil.